The quality of your ingredients really affects the outcome of this dish, so splurge at your local market and bring home some fresh produce! Enjoy! 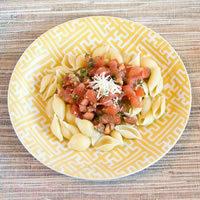 In a bowl, combine vine tomatoes, fresh basil, balsamic vinegar, raw and roasted garlic cloves and roasted garlic oil. Salt and pepper to taste. Cover bowl and refrigerate for 24 hours. Serve on top of whole wheat pasta and sprinkle with Parmesan cheese. You can also bake on top of a baguette for bruschetta.